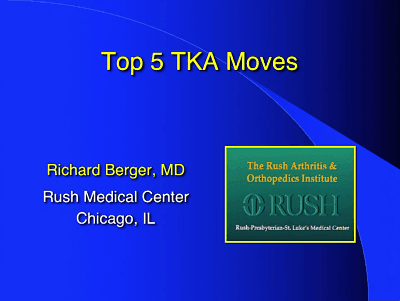 At ICJR’s Winter Hip & Knee Course, Richard A. Berger, MD, from Rush University Medical Center in Chicago, Illinois, shared the tried-and-true techniques he relies on for surgical management of primary total knee arthroplasty (TKA) patients. Restore bone loss and the joint line. Most TKA patients have bone loss and flexion contracture, 2 issues that need to be addressed separately. However, surgeons have traditionally been taught to remove more bone from the distal femur, which Dr. Berger said doesn’t make sense because it leads to mid-flexion instability. Do a bigger posterior release. With that first point in mind, Dr. Berger removes less bone than he is replacing, which lowers the joint line. Because this worsens the flexion contracture, he compensates by doing a bigger posterior release, all the way on the lateral and medial sides. He may even take the entire posterior capsule off the back of the knee. He said this provides great range of motion, as well as stability throughout the arc of motion. Dr. Berger makes his cuts from the side and with the knee in extension. This allows him to avoid forcibly dislocating the knee at any point in the operation. Do more unicompartmental knee arthroplasties (UKA), including lateral UKAs. Dr. Berger said his happiest knee patients are this UKA patients, so he encourages surgeons to consider doing more of these procedures. Do more cases in an ambulatory surgery center. Working out of a surgery center gives the surgeon more control over the surgical process and allows more patients to go home the same day as surgery. In the past year, 75% of Dr. Berger’s UKAs, more than 70% of his total hips, and just under 70% of his total knees have gone home hours after surgery. For more on these tips and techniques, click the image above. Dr. Berger has disclosed that he receives royalties from MicroPort.